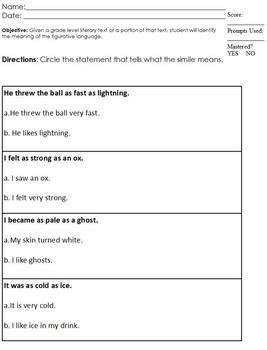 This simile worksheet is modified from the middle school vocabulary curriculum. There are three levels of the similies. The pages are all excactly the same, giving four similes for students to interpret. except for the answer choices. The differentiation is in the answers. The first page has two answer choices, the second has three answer choices, and the third asks students to write their answer. Students should not realize their page is different from peers, so this makes differentiating easy and painless! 3.A.7.c. 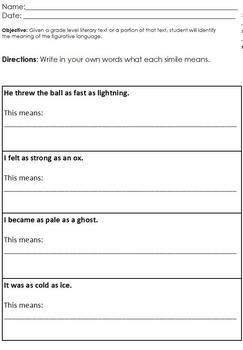 : Given an example of a simile or metaphor from a modified grade-level literary text or a portion of that text, student will identify the meaning of the figurative language. A helpful key in the top right corner assists teachers with data collection and easy scoring.